Undoubtably, the 4th of July week is one of the most fun weeks to visit the Outer Banks. Independence Day is a day of celebration and patriotic pride. A time for friends and family to cook out, decorate everything in red, white, and blue, and embrace summer as the fireworks light up the night sky. And if you love fireworks, you need to book a vacation now because seeing fireworks over the ocean is an experience unlike any other! The town of Kill Devil Hills shoots off fireworks on July 4th from the Avalon Fishing Pier. Kill Devil Hills oceanfront homes and oceanview homes within a few miles north and south of the pier will have an awesome view! The last two houses on the list are located in Nags Head. 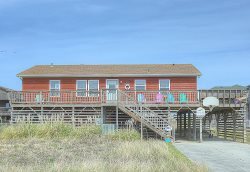 The town of Nags Head puts on a firework show from the Nags Head Fishing Pier so oceanfront and oceanview homes within a few miles of the pier will have a great view! Remember, the view you have of the fireworks from your Outer Banks beach rental will depend on the height of neighboring houses. Some homes may have an obstructed view, especially those that sit back a row or two off the beach. You can always walk out onto the sand at the nearest beach access for a better view or go directly to the site of one of the many fireworks shows around the OBX (the towns of Manteo and Corolla also have 4th of July fireworks displays!) Luckily, when fireworks are shot up into the sky off the pier, they are visible for a pretty far distance so if you have a tall beach house deck, chances are you'll be able to see them! If you have questions about the location of a particular home, our guest services representatives are happy to help!